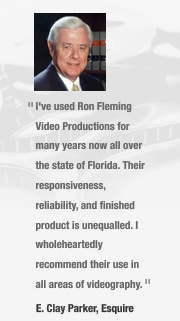 Since 1982, Ron Fleming Video Productions, Inc. (RFVP) has specialized in all aspects of legal videography and photography for many thousands of attorneys across the state of Florida and nation. Prior to forming RFVP, Ron was a broadcast news reporter and videographer for the local ABC and NBC affiliates. Over that 10 year period, Ron produced more than 2,000 televised news stories, some which aired nationally. Now with RFVP, Ron and his talented team are devoted to producing effective legal video and photographic communications for use in mediation and trial. Attorneys often comment that our professional productions helped play a key role in the outcome of their cases. Presently, RFVP employs a full-time staff of seasoned videographers and office support staff. Each of our videographers has a television background with numerous years of production experience. They are fully-trained in the specifics of legal videography and working within the guidelines of our NCRA Certified Legal Video Specialist designation. Our staff consistently produces superb work that is informative, engaging, persuasive and effective in achieving desirable results. Click photos for more information about our staff!